We are going to go into some detail about Cattleya orchid care. These orchids are probably the easiest to care for and like all plants need water, light and fertilizer. Playing some nice music or talking to them doesn't hurt either! Most of the wild Cattleya orchids grow in rain forests of South America, namely in Argentina, Bolivia,Paraguay and Mexico. They flourish in the Andes from altitudes near sea level to high altitudes of 9,000 - 10,000 feet. These orchids are truly epiphytes. (An epiphyte is a plant that lives above the ground on another plant, not as a parasite but using the plant for supportand deriving nutrition from the air.) They are used to being partly covered by the canopy of the rain forest and get considerable humidity and bright light. These are good conditions to grow Cattleyas. As with all orchids it is important to know what conditions are specifically required for optimum growth. Since these plants grow in the forest they are used to diffuse but bright light. 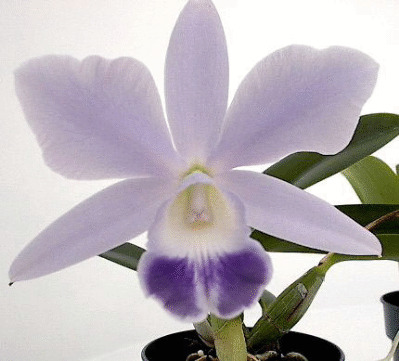 Cattleya orchid care generally does not require direct mid day sunlight. It is bright light which helps them to develop firm pseudobulbs. Pseudobulbs are the orchids main way to hold water which is so important for their growth and life. In the forest at various heights there is a wide range of temperatures where these Cattleya orchids grow. In the winter and higher altitudes these plants become accustom to temps which can go as low as 50 - 55 degrees F.(10 - 13 C.). In the warm season they can go high as 80-90 degrees F.(27 - 30 C.). 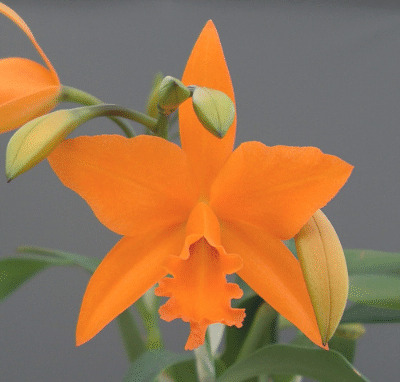 The care of Cattleya orchids should have some temperature changes to help them grow and bloom. Temperature variations of at least 10 degrees between day and night are great. Humidity is a friend to Cattleyas. We can see why since they are native to rain forests. Most Cattleya orchids do well set on humidity trays. These are metal or plastic trays that have water in them. The plants sit above the water and the plant roots do not sit in water. This increase the humidity around the plants and helps prevent root rot. It is also important to allow for good air circulation, however do not sit the plant in the direct line of a heat or air vent. Generally, watering is also important in Cattleya orchid care, so twice a week does well during their growth and flowering period and once a week during their period of rest. Cattleyas are orchids that can and should get dry between watering after blooming. This aids in the growth of healthy pseudobulbs. Be sure that the potting medium allows the water to drain out fairly rapidly. To check to see if a plant needs water stick a wooden pencil or your finger about 1 inch into the potting material and see if it comes out dry or damp. If dry it needs watering. If damp it may be able to go another day or two without water. When watering allow the water to flow into the plant and then drain right out into the sink and not into the humidity tray. You can let the water water flow onto the plant for about 30 seconds. Repeat this several timesover a 15 minute period and and the pseudobulbs will get enough water for storage.If plants blossom in the winter or spring this means that these orchid plants deserve a rest period of about 6 to 8 weeks. During this time water them about once a week and keep the lighting the same. If the plants blossom in the summer time no rest period is needed. Fertilizing should take place about every other week with a balanced formula like 20-20-20. 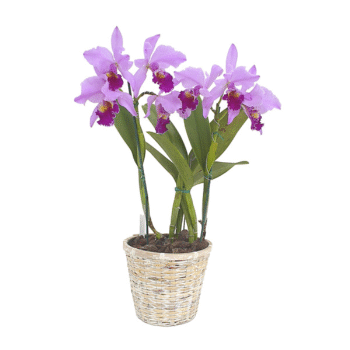 The saying is "Weekly, weakly" which means it is good with orchids to dilute the fertilizer to half or one quarter strength and fertilize more often.With these rather easy steps of Cattleya orchid care you will get many years of joy with your plants. If there are other popular orchids that you would like to learn about check out the page on How To Grow Orchids. 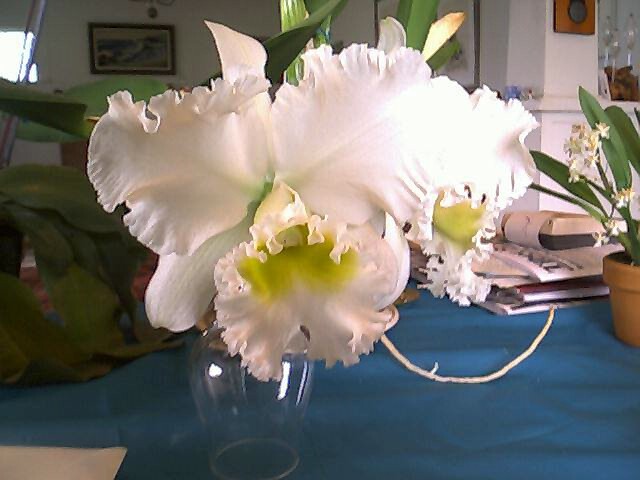 Below is a picture of a HUGE beautiful, fragrant white Cattleya from my collection. ENJOY!